When times are tough and money is tight, sometimes a change in the home can do wonders for your spirit and mood. And if you are moving into a new place and want to make your own mark, a transformation of colour or a new interior design can really bring a fresh feel to a room or space. Householders worry about the cost of making these sorts of changes but not all changes have to be expensive. What you do need to invest is your time, your thoughts and your enthusiasm. Here are a few cheap tips. The best way to give yourself a new colour scheme without breaking the bank is to find some free paint! Spend half an hour or so ringing round your friends and family, asking them to dig out their half-finished tins from the backs of their sheds. Then spend an afternoon rounding them up. 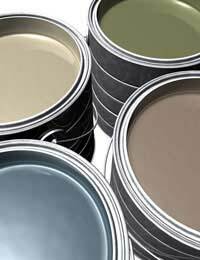 When you get home, try mixing the colours together until you get some shades you are happy with. Remember, a whole room does not need to be painted in one colour. Find tones that complement each other in order not to restrict yourself by lack of paint. Paint different walls in different hues - and do the same under and above dado rails, picture rails and cornicing. You could also consider creating just one “feature wall” within a room. Either do this using the free paint you have rounded up or using wallpaper. Again, ask around. Lots of people have one or two rolls left over from papering a space. Otherwise, ask at the counter in your local DIY shop. There is often a roll or two left at the end of a line - and you might be lucky and pick up a bargin. Other innovative, cheap and cheerful solutions include using magazines and newsprint on a feature wall, then lightly colour washing over the top. Or even painting a mural - once again using those tins you have collected from friends and family. Don’t forget that changing a few accessories in a room can also have a transformational effect. Look at your room and then decide on a colour scheme. Spend an afternoon or so going round discount and second-hand stores rounding up items that work well together colour-wise. For a bathroom, look for towels, tooth-brush holders and soap dishes etc. For a kitchen, you want plates, fruit bowls and racks etc. If you are looking to transform a living space, look for vases, candles, cushions, rugs and throws. These need not cost a fortune but can really give your room a different ambience. Moving along the same lines, consider bringing in a few pot plants and pictures. Ask friends if they can split plants or give you seedlings. Visit garden centres and local shops to snap up their special offers. Consider visiting those discount stores again to find brightly coloured or stylish pots that will match your design. Pictures can also really help to bring a fresh feel to a space. Take your own photos or consider framing artwork by your children. Look out for reasonably priced prints in cheaper shops or on-line. These days it is easy to buy very reasonably priced ready-made frames straight off the shelf. And why not be daring and go for some large sizes that will really fill your walls?